Poise and Precision. Two simple words to strike fear into the hearts of most professional violinists and the same two words that embody the five Mozart Violin Concertos. Fear because these are the standard works almost always required at orchestral auditions; lucky the player who has not had at least one Mozart disaster in front of a demanding panel. The simple reason they appear on every list of audition works is not just that they are the epitome of the Classical period violin concerto but also because they require a superbly refined technique and perfect control to be performed successfully. 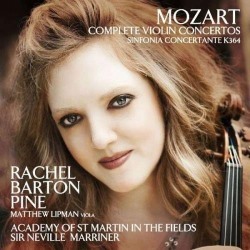 All of these qualities the superb violinist Rachel Barton Pine possesses in abundance. This is a delightful set, beautifully performed and presented and supported by typically high quality production from producer Andrew Keener and engineer Simon Eadon. Remarkably conductor Sir Neville Marriner was in his ninetieth year when this recording was made. I was struck quite forcefully while listening to the set how its performance and production values hark back to the early years of The Academy of St. Martin in the Fields from their first recordings in the early 1960s. For many years their recordings set a gold standard for pre-Romantic repertoire. To buy their LPs was a guarantee of superb musicianship, technical virtuosity, appropriate choice of tempi and 'scale' backed up by state-of-the-art recordings. No surprise that the technical and virtuosic side of things remains intact in the Academy of 2013 vintage but Marriner's vigour on the stick and the palpable joy in the music-making are things of wonder. Central to all of this is the quality of Pine's violin playing. It strikes me that she is a very kindred spirit to Marriner. She plays with exactly the kind of lyrical alertness the music requires. These are performances on modern instruments at modern pitch. No contemporary player could play these works today without a degree of awareness of historically informed performance practice but what I particularly like about Pine's approach is its unfussy simplicity and directness. Maynard Solomon in his biography 'Mozart - A Life' makes the point that these works come from a period in Mozart's life when he was writing Serenades for instant consumption by the Viennese public. Allied to that they fulfilled his own professional need for display works for his famed tours of the Courts of Europe during which he was known as much for his performing virtuosity on keyboard and violin as being a genius composer. The 'legacy' of the Serenade form is that these works have a song-like lyrical quality wholly suited to the violin as well as not being constricted by traditional formal/structural considerations. H. C. Robbins-Landon wrote of "melody ... piled on melody ... new ideas succeed each other in blissful insouciance of each other and of any strict formal pattern." One last piece of evidence for the extended pastoral idyll embodied by these works is the fact that the opening of the G major concerto is no less than a reworking of an aria from his serenade-opera Il rè pastore. I suppose the one sorrow in all of this is that the five concertos are bunched together in this relatively early period of Mozart's compositional career. He never returned to the genre at the height of his composing genius. For evidence of that listen no further than the Sinfonia Concertante which is included here. As mentioned, Pine and Marriner make a wise virtue out this direct and almost artless music. Mozart wrote the third-fifth concertos in 1775 when he was nineteen. The concerto numbered No.1 was probably written two years earlier with the nominal No.2 also pre-dating 1775. Certainly 3-5 are the best known and most often played. Pine opens the first disc with No.4 in D K.218. The form of all five concertos is the same; a sonata-form first movement with a double exposition - the orchestra introduce the themes before the soloist plays them all over again, with a cadenza just at the end of the development. The central slow movement is song-like in a contrasting key and the finale - in four of the concertos - is a Rondo. From the very opening, all the virtues of the playing on this set are apparent. There's alert and articulate playing from what sounds like a fairly small string body. The recording is quite close which allows all of the detail of Mozart's energetic inner part writing to register to maximum effect. The balance between the orchestral strings and the woodwind is ideal. Likewise Pine's violin is clearly placed in front of the larger group but not unrealistically so. I really like how Pine's phrasing is subtly discreet. There is always a terrible temptation to over-point the phrases in Mozart - a lemming-like need to 'prove' to your audience that you are really playing it. This can help cover up some of the technical shortcomings but since those failings do not apply here we are left to enjoy the pristine beauty of Mozart's writing. This is not to say that these are faceless or anonymous interpretations. Pine brings an important element of herself to the music by providing all of the cadenzas in the concertos. These range from extended showpiece displays to little cadential ornamentations at the end of phrases. In compositional terms Pine is extremely successful at revisiting the thematic material of the movement in hand and treating it in a more overtly virtuosic manner. No doubt some will feel the consciously larger 'scale' of these cadenzas combined with a significantly higher technical demand is neither true to the original music nor appropriate. I take a completely different view: such cadenzas allow the soloist to bring the music into the present and reflect contemporary violin technique thereby making the music part of today. Rather to my surprise I found myself enjoying the first two concertos here as much as the better known later three. The playing of the Academy oboes and horns is a particular delight - it's that 'poised' word again - but balanced against the bubbling energy of Mozart's contrapuntal writing. The recording is consistently excellent at capturing the bustlingly dynamic string parts which the Academy members play with exceptional alertness. The Fifth Concerto opens the second disc and is, in many ways, the hardest of the set to bring off. Not because it is significantly more technically demanding than the other four but because of the kaleidoscope of musical moods that Mozart writes within each movement. The problem for the soloist is to cohere these potentially disparate sections. So after the 'predictable' Allegro orchestral opening the soloist, instead of repeating the material counters with a soulful adagio. Interestingly Pine pares back her vibrato here, giving the music a rather sombre and bleak character so that when she does return to the opening allegro material - albeit with a variant - the contrast to joyous sunlight and a sense of release is underlined. I like Pine's description of this passage in her own well-written liner as "an operatic dialogue between two characters, at times flirtatious, sentimental, anxious and even angry." Throughout the set dynamics are very well contrasted with phrases echoed to maximum effect. The influence of period practice is more evident in the central Adagio. Here the Academy strings are again quite sparing in their use of vibrato over which Pine floats her part with artless lyricism. As throughout the set, Marriner is masterful at finding a tempo which allows the music to sing but not stagnate. The inner pulse gently keeps the music moving forward. The finale is again notable for the numerous varied sections including a well-known example of Mozart's 'alla Turca' music. I am not sure I have heard these sections played with such fire. There is a theatrical energy to the accompaniment and Pine imparts a gypsy dynamism which is in striking contrast to the earlier ethereal adagio. This well-demonstrated skill is again to make a cohesive whole of these sections. I found myself thinking that Pine's operatic analogy quoted above applies very well here too. Even within a single music line she creates a dialogue between a 'soprano' line and an answering 'bass' phrase. This is the most interventionist performance in the set and one that I could imagine some finding too extreme. To my ear it breathes new life into music that can sometimes be allowed to become too rarefied. The set closes with the undisputed masterpiece of Mozart's string concertos - the Sinfonia Concertante for Violin and Viola K.364. To quote Maynard Solomon again; "with Mozart's Sinfonia Concertante of 1779 there is a shift toward quite unexpected conceptions of beauty which now embody a sense of restlessness and instability, and even of the dangerous or uncanny." On every level this represents an extraordinary degree of progression in just four years' life. Marriner encourages his players to even greater heights of expressive intensity. I wondered if an extra desk or two of strings were added - if not the existing players quite deliberately bring an extra weight of tone which is wholly appropriate. Pine is joined by Matthew Lipman in his first recording. Enormous credit to him that he proves to be such an equal partner. This is a thrilling and moving performance of a great work - the undoubted highlight of an already impressive set. Again, I love the way the performance is supported by the production to allow the genius of Mozart's inner part writing to register. The capricious interplay of the soloists is a joy to hear. Sometimes I worry that classical music has this image of serious-faced musicians playing "great" music in a rather sober and stilted way. Just hearing this performance you know with absolute certainty that there was real delight and pleasure in the studio the day they recorded this. It bursts from the speakers in the most life-affirming way. Playing music this well is fun as well as being profoundly moving. The central Andante is a sublimely melancholy song-duet. Again pacing is perfection with the bass line gently urging the music forward. It is quite possible to invent one's own narrative for the dialogue between the two instruments: the violin questioning, the viola reassuring before they join in one of those heart-stopping intertwining passages that reinforces the notion that so much of Mozart's greatest music is vocal in character. The closing Presto throws off the doubts and preoccupations of the preceding movements and brings the entire set to an uplifting close. The two instruments are exceptionally well-matched. Pine's Guarneri 'del Gesu' to Lipman's Goffriller. Lipman's viola has a lighter tone than some which allows him to match Pine's quicksilver brilliance to great effect. The cadenzas are those composed by Mozart. As briefly mentioned, Pine contributes the insightful and interesting liner-note which is printed in the standard tri-lingual English, German and French. Production values are exceptionally high. Keener and Eadon have caught the orchestra quite superbly with the balance between acoustic warmth, tonal weight and inner detail as near to ideal as makes little difference. I have nothing but praise for all of the artists involved. This is another major addition to Pine's impressive discography. That said, it would be hard to finish this review without once more celebrating the remarkable achievement of Sir Neville Marriner and his trusty Academy in producing yet another recording that is as revelatory as it is a joy to hear.